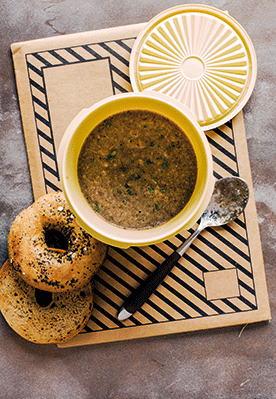 You can rustle up this earthy soup from start to finish in under 30 minutes. Aim to use at least two mushroom varieties to achieve depth of flavour. Serve with a seeded bread roll or bagel for a filling lunch. 1. Heat the oil in a large saucepan over a medium heat. Add the shallots and garlic and cook for 5 minutes until softened. 2. Add the fresh and dried mushrooms, and 600ml/21fl oz/2½ cups boiling water. 3. Stir well and bring to the boil, then reduce the heat and simmer for 10 minutes or until the mushrooms are cooked. 4. Remove from the heat and add the parsley and almond milk. Blend the soup using a blender or food processor. Season with sea salt and plenty of black pepper. 5. Divide the soup among four freezer-proof containers, then cool and freeze for up to 3 months any that you don’t want to eat soon. Defrost overnight in the fridge. Reheat a portion before you go to work and transfer to a vacuum food flask – or reheat it at work. Dried mushrooms are a great store cupboard staple and make a rich addition to soups and stews. If you don’t have any, use vegetable stock instead of the water. Packed with... Mushrooms have been used for their immune-supportive qualities in Asian cultures for many centuries, and they are extensively researched for their cancer-preventative properties today. As a good source of energy-boosting B vitamins, iron and zinc, our fungi friends really are a wonder food.